UNITED NATIONS, December 28 -- The UN confirmed the death of South Sudan rebel George Athor, and on Wednesday belatedly and indirectly did the same with the widely reportedly killing of Darfur rebel Khalil Ibrahim of the Justice & Equality Movement. The UN declined, however, to answer a question about the UN's (non) response to Khalil Ibrahim's requests earlier this year to be extricated from Tripoli. "On Sudan, while it seems well established, please state if the UN can and will confirm the death of JEM leader Khalil Ibrahim, if the UN has any comment on the death, and if the UN ever did provide any assistance in getting Khalil Ibrahim out of Tripoli. The UN has responded on the death of George Athor - can it now comment who killed Athor, where and how?" "JEM has confirmed that its leader, Dr. Khalil Ibrahim, was killed. UNAMID is monitoring the situation in Darfur closely and has not seen any reaction on the ground at this point. We do not have further information on General Athor, except to say that the South Sudanese Government said he was killed in a clash." Why no answer on whether the UN ever responded to Khalil Ibrahim's requests? And what of the observation that following the divorce of Khartoum and South Sudan, each has managed to kill its highest profile rebel? Are these killings the real "peace dividend," or the win-win solution of sub-dividing the state? When Khalil Ibrahim was trapped in Tripoli and asked UN help to get out, no help was provided. 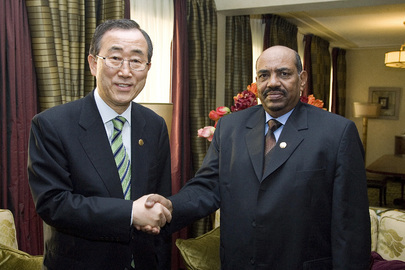 Some say the UN, on behalf of Khartoum, wanted Khalil Ibrahim dead. By contrast, the UN at least twice flew Ahmed Haroun, indicted for war crimes in Darfur by the International Criminal Court, by UN helicopter to and from Abyei. So an alleged war criminal who is part of a state can be given free flights in a UN air craft; a rebel against the state can be left to die in Tripoli, or uncommented on in North Kordofan. Now the UN says that following this death, it "has not seen any reaction on the ground at this point." We'll see.